Cherry Hill teachers and husband and wide team Kim Redfearn and Steve Redfearn compete at the 2012 Dancing with the Cherry Hill Stars. What made Dancing with the Cherry Hill Stars so successful? The answer depends on whom you talk to. Stofman feels Dancing with the Cherry Hill Stars has been able to continue growing because of how much fun it is. Hundreds have been involved with the event since its inception, and Stofman talks of how everyone wants to return after being involved with the show once. “We keep getting new people involved, and once we get them involved, they want to come back and volunteer another year,” she said. Molotsky feels the show is successful for similar reasons the television show has been so successful. He talks of how the event has community leaders performing, out of their element, on stage. 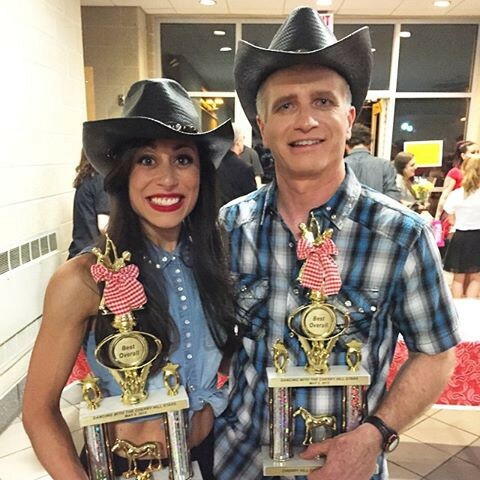 Dancers Alyssa Cabrera and David Hulbert show off the trophies they won for best overall performance at the 2015 Dancing with the Cherry Hill Stars. “We have doctors and politicians and business people all doing things that their friends, family, co-workers are all excited to see them do because it's not something they normally see them do,” Molotsky said. Meloche credits Molotsky and outstanding work with directing the show as a reason people enjoy attending. “He volunteers his time in so many ways, but his vision and what he’s able to put together for this show is incredible,” Meloche said. Keleher believes the show has kept going because of the large number of volunteers who come back every year. He credits Stofman for getting so many people excited for the event. When talking about Dancing with the Cherry Hill Stars, a lot of people refer back to Stofman when talking about the show’s success. 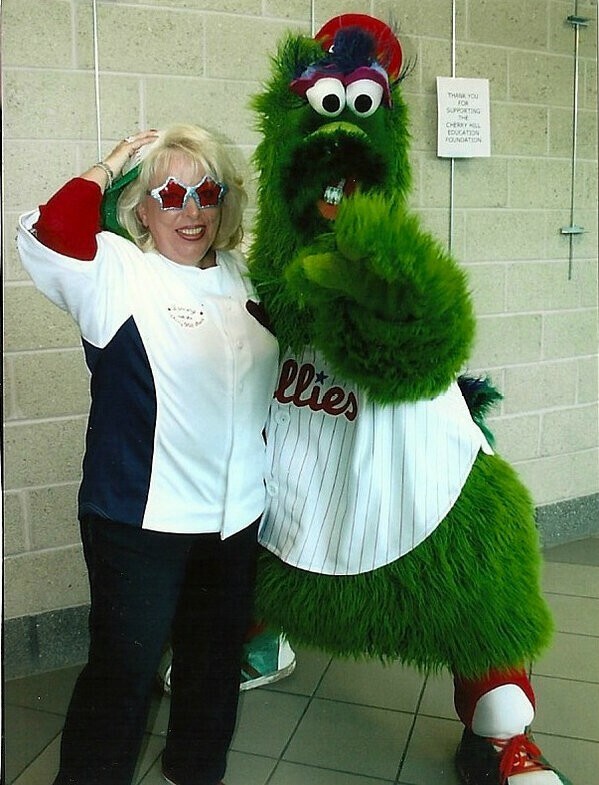 Cherry Hill Education Foundation President Eleanor Stofman and the Phillie Phanatic greeted guests at the first Dancing with the Cherry Hill Stars in 2008. “Eleanor Stofman is the answer to any question that has to do with Dancing with the Cherry Hill Stars,” Molotsky said. Gagliardi said the event’s longevity is a credit to Stofman’s commitment not just to fundraising, but also to the Cherry Hill schools. Meloche described Stofman as the embodiment of how much a difference one person can make in a community. “There have been challenges with the event through the years, but she continues to move forward in a positive manner,” Meloche said. Stofman refuses to take a lot of the credit. She said the dozens of people working on the crew deserve recognition for all of the hard work they have put in over the first nine years. Stofman also gave credit to her fellow CHEF officers, Susan Bastnagel, Phyllis Jones, Sam Kates, Jon Cohen and Linda King, for their role in keeping the event going strong. “They do all the work with me, all the tickets and all of the decorating and all of the work behind the scenes,” Stofman said. Stofman admits in 2008 few people thought the show would continue for an entire decade. Today, however, she couldn’t imagine having a year without the event. The most important aspect of the show is the amount of money raised for CHEF. The foundation uses the money it raises to fund grants for various education programs in Cherry Hill schools. The work on Dancing with the Cherry Hill Stars won’t stop when the curtain drops next Sunday. Stofman already has a list of interested participants ready to go for 2018 and will start to make plans for next year’s show just as this year’s show wraps up.